Martin Henry Child was the eldest son of Thomas Henry and Nancy Child of Connaught Rise. Reading. His is a registered war grave with an impressive private memorial. His parents and sister are buried with him. Grave number 16530. 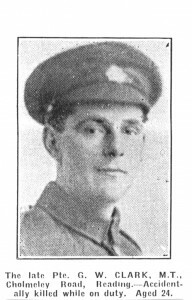 Martin Child’s death on the 13th November 1918, aged 21, must have been all the more tragic given the declaration of the Armistice only days before. An account of his death and war service was published in the Reading Standard on 30th November 1918. “Death of Second Lieut. M.H.Child – who passed away on Nov. 13th at the Cottage Hospital, Uxbridge, from pneumonia, at the early age of 21. Educated at Christ’s Hospital Horsham, later became a member of staff at Sir Samuel Scott and Co.’s branch of Parr’s Bank. At the age of 18 he joined the Royal Naval Air Service as an aerial gunner, and on April 2nd 1917 proceeded to Italy, was stationed at Tatanto, where he fell victim to malaria fever. After being in hospital in Rome for several weeks, he was invalided to England, and arrived home in January 1918. The Medical board deemed him permanently unfit for further flying. Stationed at Warash, he was promoted to the rank of sergeant and shortly after commissioned as an armament officer. His commanding officer wrote well of him. The funeral from the Wesleyan Church Oxford Rd and interment in Reading cemetery”. 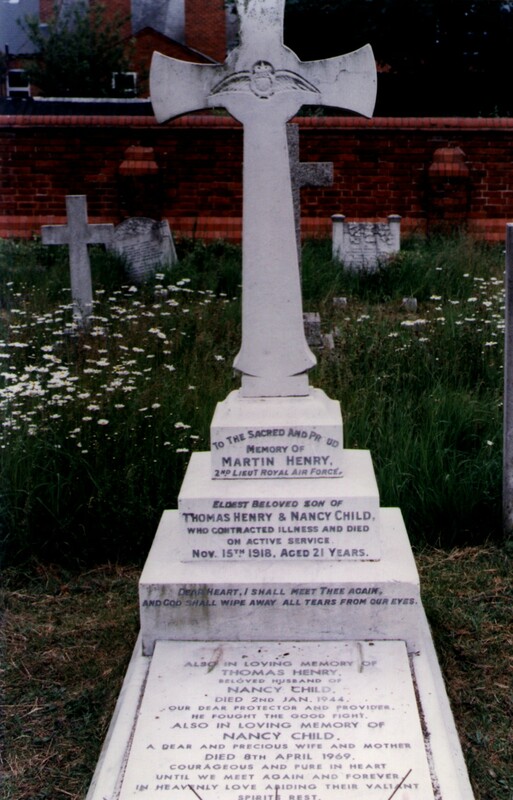 Thomas Cyril Church was the youngest son of Henry William and Fanny Church, of 56 Orts Road, Reading. 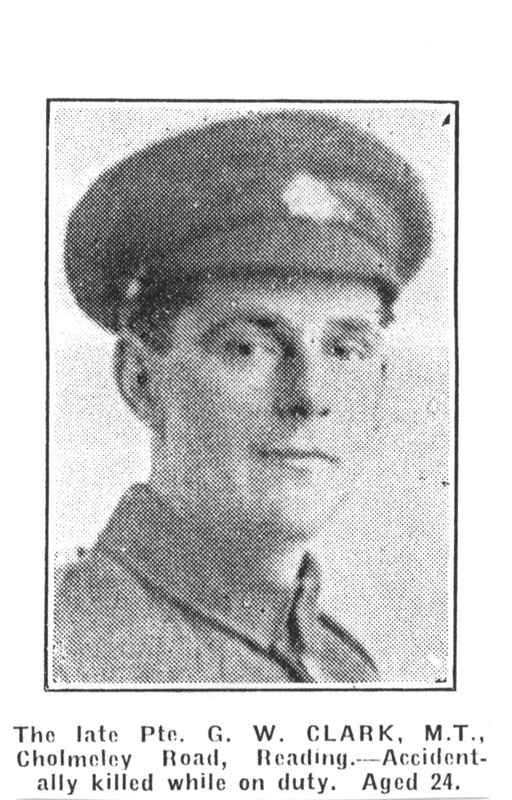 Tom Church was 18 years old when he died of pneumonia on 17th November 1918. His is a registered War Grave with a family memorial headstone and also a war pattern headstone because the original inscription is now unclear. Grave number 16535. The announcement in the Standard of 23rd November 1918, states that he died at Colchester Military Hospital, after great suffering patiently borne. His war service details have not be found. Tom Church is buried near to his brother in law Victor Houghton Wicks who died in 1921 in the R38 Airship disaster. Tom Church is commemorated on the Huntley and Palmers War Memorial. 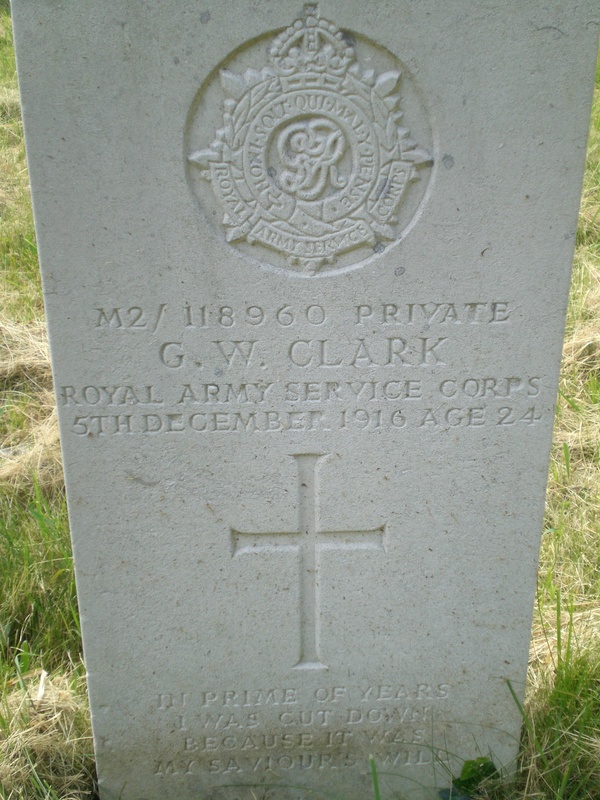 George William Clark was the son of Mrs Amy Clark of 29, Watlington St. Reading. George was accidentally killed whilst on duty on 5th December 1916. He was aged 24. The author has found no other information about the circumstances of his death. The grave of George Clark is marked with a CWGC war pattern headstone, the grave number 8757.